Oh soothe my sweet aching beard, this is good! Bedfordshire Beard Co ‘Dark Pepper’ Beard Balm gets the Golden Beard Award without any hesitation, in fact I knew I had to as soon as I used it the first day! Bedfordshire Beard Co ‘Dark Pepper’ Beard Balm has a medium consistency and so is easy to scoop from the tin, I applied a small amount and instantly I was hit with the most amazing scent, a warm deep peppery scent mixed with Cedarwood that is at the perfect strength and underneath that sits the floral scent of Patchouli that doesn’t try to compete with that warm peppery scent. It doesn’t take much of the ‘Dark Pepper’ Beard balm to keep your beard in hold and looking good, I literally love this balm and what is really good is that the scent lasts the whole day, but it’s not because it’s a strong scent. My wife kept saying that she was getting the dark pepper scent every now and then she also really like the scent (which is rare). I was sent their ‘Mango‘ Moustache and the two scents worked very well together. Made from Shea Butter, Beeswax, Almond oil, Grapeseed oil, Hemp oil, Apricot kernel oil and Jojoba oil with the Black Pepper, Cedarwood and Patchouli essential oils, Bedfordshire Beard Co ‘Dark Pepper’ Beard Balm left my beard feeling softer and smelling amazing and the balm kept on going throughout the day. I would have no hesitation in recommending this beard balm. 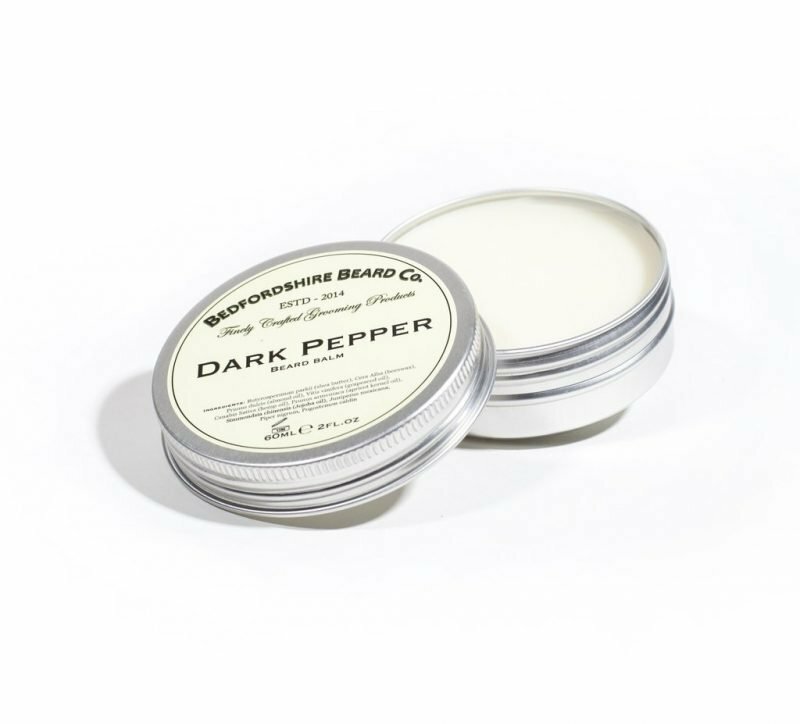 Bedfordshire Beard Co ‘Dark Pepper’ Beard Balm comes in a 60ml (2 fl.oz) screw top tin and is available from their website for £14.99 with free shipping on orders over £40 and the balm is also available in the following scents. Sawmill – A warm and woody scent. Or you could buy the Mini Balm Multipack for £29.99 which contains a 15ml tin of each balm! Bedfordshire Beard Co also sells a range of Apparel, Hair care and Shaving products and you can keep up to date with them on Facebook, Twitter and Instagram.